Frank Larking, was a member of our committee. His story was first published by Percy Allison in November 1987. Only a few of the pictures from the book which will be reprinted later this year, are included. In 2003, the wharf was restored, but the shed on it was not replaced. Frank was fighting the authorities to get a shed replaced on the wharf. A regular ferry service now runs from the wharf. The Frank Larking Support group wrote to the Guiness Book of Records to try to get them to include him as "the only man in the world to build a beach." They replied that "they receive 10,000 requests a year, but he does not meet their criteria." The Support group replied to ask; "Did it mean that Frank had to build two beaches to qualify?" In the New Year Honours in 2003, Frank was honoured with the Queen Service Medal (or as he believes Queen's Sand Mover). Despite the cramped and primitive conditions the first of the children was born there, The family eventually extended to a boy and three girls. 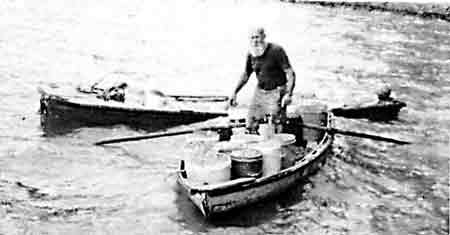 Frank rowed his dinghy across the harbour to his work at Hobsonville daily. At week-ends he made his boat available to young people who wanted to fish or just row for pleasure and practice. This was Frank's first community task and the forerunner of a host of others spanning the next 38 years. Bev. and Frank decided that the small shack was no longer suitable as the family grew and they started on a larger house to the rear of the army hut. Costs were a factor and Frank decided to go it alone on his small savings and service pay. It was before the era of the "Ready Mix" trucks and it took him the whole of the first year to cast the 2,785 blocks needed for the new venture. Little did he realise that by the time the task was finished the children would be ready to move into the larger world outside. Thirteen and a half years later the 4 bedroom, 1,500 square foot house was finished and paid for. It was sad that the family was not long together to enjoy it. Despite the long years on the house Frank did not lose sight of his community obligations. The local Girl Guides badly needed a building for their activities. Council had provided some land behind the Verran's reservoir. The timber for the job came from the old Birkdale school and it was completed over a period of six months. Frank was the mainstay worker of this project. There was also the self imposed task of keeping the Beach Haven Wharf beach clear of gorse and blackberry. Storm flotsam and jetsam was quickly cleared. Then by 1952 Frank was posted to Fiji. The overseas posting soon went sour. A Mastoid developed behind Frank's ear. This was a recurrence of an old cyst trouble which had first developed when he was on a prior overseas stint in Japan. By 1955 the trouble worsened and an operation was performed which was partially successful but a resultant clot on the brain led to a paralysis down the right side of his body. A further complication was a speech loss which lasted for two and a half years. This affliction would deter many a lesser man, 'but Frank battled on. The illness had robbed him of some functional thinking ability so he took a correspondence course to bring him up to a higher secondary school level once again. As Frank's physical problems ceased he took a positive part in his own rehabilitation. He carried on with his block making and laying and re-commenced the daily rowing to the Hobsonville base. The Beach Haven Sea Scouts were given an old former electrical-come shoe repair shed (situated where the Mokoia Car Park is now) for their new headquarters in Shepherd's Park. Frank was a key figure in the wrecking and reconstructing process. The iron and timber from his old shack went to this den als. Bev. and Frank helped fund raising for the local Birkdale Free Kindergarten committee. They helped Penny Paltridge in her successful quest for the local Queen Carnival event during that period. In 1964 Frank turned his attention once again to the Beach Haven wharf area which was being eroded. Some heavy planks were obtained, driven in to the beach and back filled. Not an easy task even for a young fit man. The Beach Haven Sea Scouts progressed from their old tin shed at Shepherd's Park and were given a new site at Tui Park. This time a group of interested parents were involved. 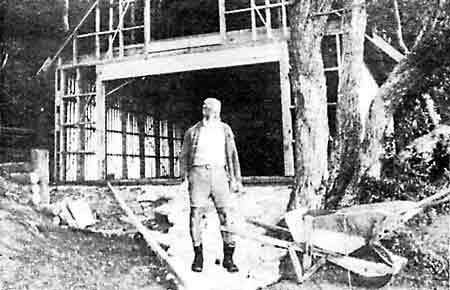 Nevertheless, Frank was there and participated regularly over the next ten years until the building was finished. A man at Herald Island had a long boat in need of repair. He gave it to Frank for community use. It is believed to have been one of the lifeboats from the ship "Niagara" which had sunk off the Hen and Chicken Islands in 1940. Frank set to and repaired this boat and donated it to the local children. It was aptly named; "Children of Beach Haven". Unfortunately a violent storm in 1970 proved too much for it and it was damaged on foul ground by the wharf. But again, never dismayed, Frank pounded and chipped at the rocks until it was released. He turned it upside down and laid out £40 at his own expense for concrete and timber strengtheners and there it rests today; a playground memorial! The Maori translation, I believe is: "Pelting sound of tide." Another memorial is the Beach Haven Wharf of which Frank has been honorary warden, caretaker, carpenter and protector against demolition. No wharf was so well looked after, even the steps were scrubbed at regular intervals over a thirty year period. A threat to demolish the wharf did occur in 1967. Frank and a local businessman organised the local young people into an action group and battled on three fronts - the Harbour Board, the Defence Department and the Local Council. Eventually the three bodies admitted defeat and agreed to the reconstruction and cost sharing of a restored structure. It was an action group that was a forerunner of protest today. There were poster parades, "sit ins" on the wharf, shopping night parades, and successful pleas for local Ratepayer Association intervention. The local youths also organised their own petition. Frank via the young people moved the community into healthy action against the bureaucracy. Should this fight have been unsuccessful Frank had another scheme in mind for involving the whole community. The Sea scouts, Garden Circle, Ratepayer's Association and the local Boat Club backed his scheme to have a concrete boat ramp and jetty with a concrete childrens' swim pool built along side -but with the wharf being repaired this scheme was abandoned. At the same time Frank and Bev. made representation to Council to buy Messrs Seed and Dean's properties (above the groyne) for reserve and youth activities. A further suggestion in 1987 that the wharf may again be under threat of demolition due to its state of disrepair, saw Frank and a few supporters with local Ratepayer Association backing, have Birkenhead City Council and Harbour Board agreeing to jointly share the $40,000 cost to replace the rotting piles again. In 1968 erosion of the eastern end of the wharf beach was a serious problem and solutions offered seemed either unworkable or too costly. Frank came up with a plan that the two adjoining Riparian Rights property owners thought was just feasible and they gave him $60 as a starter. The plan included a groyne from the point, back fill, sow grass and provide seating and a public area. The Birkenhead Borough Council gave full support so Frank had the green light to go ahead with his mammoth task. An ancient barge was bought from Rope Construction Bros. for ten cents and Frank repaired it for a further $23 his own account. 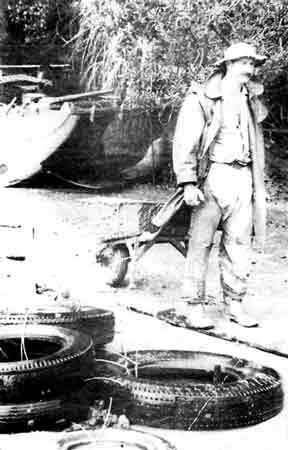 Ron Hartwell donated some steel rods; broken car axles and old pipes were obtained from Hobsonville and Frank Allan provided old car tyres free of charge. Snow McCullough transported the tyres as needed free of cost, By the time the job was completed, 2,903 tyres had been brought in and set on stakes and all bound and steadied with 14 rolls of No 8 fencing wire at a cost of $170. This was paid out of his dinghy hire scheme (10c adults - 5c children). With everything in place and the groyne fully shaped it extended 92 metres. He then back filled behind the groyne to level off the area using mud from the sea bed at low tide. Firstly, he used a wheel barrow and shovel to shift 200 cubic yards of mud. The tides allowed 2½ hours only for back filling. Later he used the barge and a rope pull to load and unload the mud fill. A total of 686 cubic yards of mud was shovelled on to the barge from the seabed - pulled to the reclamation on the tide and then shovelled out. The barge was then pulled away from the groyne and sunk on the receding tide to be filled again. Eric Townsend gave Frank a hand from time to time. It had been estimated that as a one man operation the job would take five years but Frank completed it in 2 years. In all he had worked 1289 hours on a community task that had cost the ratepayers nothing. In 1971 Frank retired from the Air Force and went on to be a boatbuilder at the Salthouse yard in Greenhithe. Soon after, to his grave disappointment, Frank learned that his 2½ year Groyne building project was illegal - it had been done without Marine Department permission - and worse - it had to be dismantled. The cost of the dismantling operation was put at $33,000. This was the start of a new and drawn out campaign against red tape and bureaucracy. It was to last for ten long years. He was not alone as 100 citizens at a special meeting in the Beach Haven Hall in 1974 endorsed what Frank had done and also the suggestions he had made to add and alter his work to comply with the changes demanded by he Marine Department. But Frank was in trouble again and had to go into hospital with a broken neck. By 1980 the bureaucrats had realigned their thinking and Frank's suggested additions were accepted. The City Council now agreed to give $1000 towards a grouted wall and the necessary machinery hire for the beach operations. Six temporary workers were allocated for 6 months under Frank's supervision. 300 hours later the stones and mud were removed from the beach and Frank returned to the action with a small garvey (barge) loaned by Neil Beken. 700 yards of sand was brought in from a sand bar in the Hobsonville channel. This was brought over the harbour, then spread on the sea bed between the groyne and the wharf and now comprises the new wharf beach. In 1985 Frank's leg was crushed in an accident at work and he was off for two months. Never an idle man despite his troubles he hobbled on to the beach and to level off the sand. A further accident in 1986 meant a few broken ribs, a problem which recurred again 6 months later. So Frank decided to retire from his boatbuilding job-he was now 62 - and return to his beloved beach. It is now 1987 and there is still 500 yards of sand to shift which the old campaigner hopes to have in place before the end of 1989. The barbecue tables and the seats are now in place on the reclaimed groyne.The children play on the reclaimed grassed area or on their very own beach. It is all as he saw it in his mind's eve many years ago. Although the modern version of Frank Larking supports a bushy grey beard, it is not the first tine he has worn one. During his Air Force days he grew a mustache but come Xmas, his countenance changed to a delightful snow white beard as he was for many years Father Christmas for the Beach Haven Businessmen's Association annual Santa Parade. 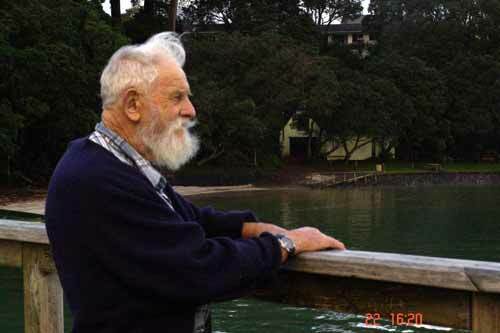 For 40 years Frank has been an active member of the Hobsonville Yacht Club and has made it his business to convey a dozen local youths across the harbour to gain their yachting skills. It is time to open the new boat shed for the local Sea Scouts. Frank was not directly involved with the building, as credits of design and construction go to Allan Walker. But Frank's ideas set the site and land purchase in motion. He concreted the boat ramp and had a hand in the surrounding rock work. 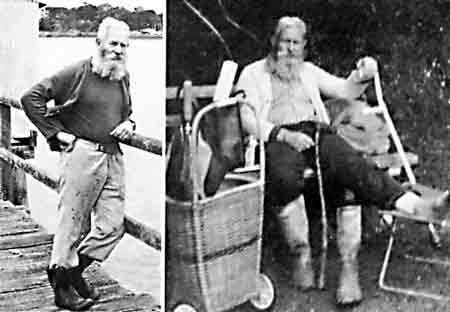 The hand rails and steps leading down to the boat shed were conceived by him although the manual task was done by others under his supervision. 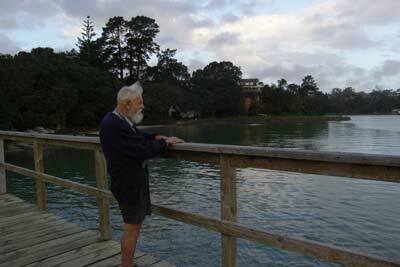 On the 28th November 1987 the Governor General Sir Paul Reeves opened the Beach Haven Sea Scout Boat Shed. At that occasion he presented Frank with a higher Sea Scout award than the two he already has received, The shed has been named: "The FRANK LARKING SEA SCOUT SHED." An honour indeed and one to add to the Beach Haven wharf groyne officially named: "LARKING"S LANDING". Frank, a man of a few words, asked to comment says: "Its all been worthwhile, a great pleasure to serve the community. Without the full support of my loyal wife Bev. it would all have been impossible".